I was recently introduced to two absolutely lovable characters, Sock and his best friend Boots. 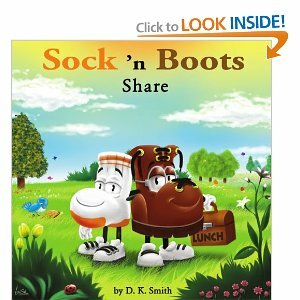 Sock (the mischievous sock) and Boots (the more level-headed boot) are the characters in the new Sock n Boots series of children's stories by D.K. Smith. The Sock n Boots franchise of stories was created to not only teach young children valuable life lessons, but also to stimulate positive thinking while building a bond between parents and children or teachers and students. The goal of the books is to transform story time into an interactive bonding time. Each Sock n Boots story begins with a question, then through the antics of the characters a lesson is taught that answers the question. Once the story is finished the question is posed again which opens the way for discussion and interaction. We hope that children and parents alike will grow to love the Sock and Boots characters while building a bond through discussing the lessons that the stories present. Each story contains a very important lesson for children--the importance of sharing, how they can deal with deal with being afraid of the dark and what could happen if they don't play where they know it safe to play. The book also contains a coloring section at the end of the book. I absolutely love Sock n Boots. I love that the stories open with a question to stimulate thinking before the story even really opens. The poetry stories and the illustrations are super cute and kept my child's attention. I also loved that their was question at end of the story as well so we could further the discussion of the story lesson. Super cute! I definitely recommend this book for young children. Sock n Boots Adventures is available through their Facebook page. Their are also putting together Sock n Boots apps for the iPad, iTouch and iPhone, so keep an eye out for those as well--super cute. Thank you to JYK PR for my sample used in this review, opinions are honest, review by Michelle.